Tombow Fudenosuke hard tip color pens have DROPPED. Let’s check them out and compare to Pentel Sign Pen Brush. Color war! I’m so excited the new Tombow Fudenosuke Color pens have arrived. Let’s take a look at how they compare to Pentel Sign Pen Brush pens. This article contains affiliate links. I have purchased all the products listed below, but I will be compensated for affiliate links. Think of it as a small donation to my pen obsession. Thanks! I haven’t had the Tombow Fudenosuke Colors pens for more than a few hours, so these are first impressions based on color, blending and durability. My first impression is that a direct comparison between Tombow and Pentel would be a bit unfair because they are not offered in the same number of colors. Tombow Fudenosuke Colors hard tip brush pens come in a package of 10 colors. Pentel Sign Pen Brush (fudenosuke touch) are available in twelve colors. 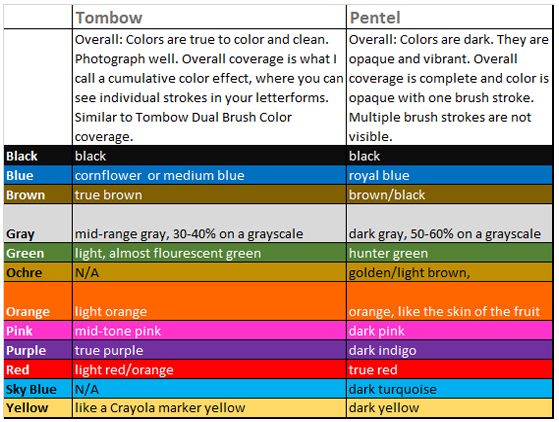 COLOR COMPARISON CHART OF Tombow Fudenosuke Colors vs. Pentel Touch - Pentel Sign Pen Brush, small pens. Disclaimer: Tombow has not yet specifically marketed these pens to blend or to be blendable. It’s often shown on Instagram as a can-do thing to extend the range of colors available in their Tombow Dual Brush Pens. The Pentel packaging encourages blending and water blending as an option. Color-on-color blending method- lay down color on a non-porous surface and pick it up with another pen and start to write. The Tombow result was more of a dry-brush look. The pink marker immediately dried on the non-porous surface and didn’t translate as expected. The Tombow Dual Brush Pens perform this action seamlessly. The dry brush effect looks pretty! The Pentel Sign Pen brush blending produced a gradient result. The pink marker remained wet when applied to the non-porous surface (watercolor mixing tray) and it produced this lovely orange to yellow gradient. 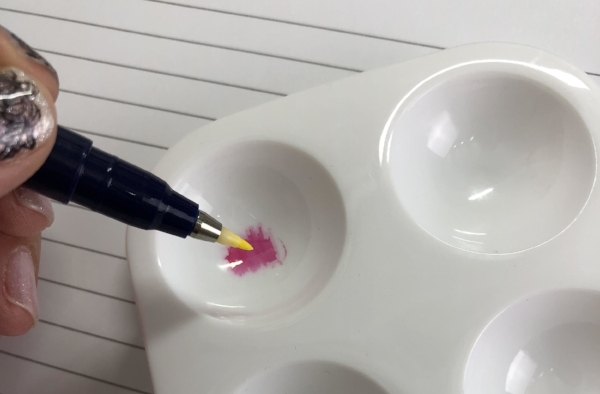 This test was achieved by dipping each pen tip in water for 10 seconds. If repeated, I would try for a little less time with the Tombow pen. As you can see with the word “water”. the pen was at about 50%. A heavy-handed writer, like me will wear the Tombow Fudenosuke pen into a hard, rounded tip over time. Similar writing with the Pentel Sign Pen Brush will yield an ultra-flexible tip. You don’t need to toss old brush pens. As long as they have ink, simply adjust your pressure for a tip that has become more flexible. You really can’t compare. The Tombow Fudenosuke Colors hard tip brush pens are more rigid, as a hard-tipped brush pen. The Pentel Sign Pen Brush pen is more flexible and comes in two additional colors. Overall it’s a win to have more options! Get 10% Off Orders of $35 or More, and Free Shipping on Orders of $35 or More! Use Promo Code CEQP. Exclusions apply. I was hesitant to buy the Slider Writer, but guess what? It's for lefties too. You can flip it over and use the screw holes in the bottom to get the clipboard holder to the left of the laser pointer. Love you, Slider Writer manufacturers. Two thumbs up for including lefties! 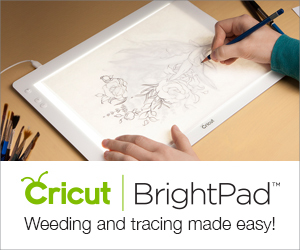 I use both the Slider Writer and my light table to get things lined up on the page. 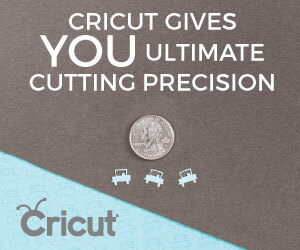 It's easier and quicker than a ruler or t-square, but you know what? I used just a t-square for years and it worked just fine. If you're in the market for toys (and who isn't? Have you seen my pen stash on Instagram?) get both! Note: I am in no way compensated to endorse products, but I do include affiliate links in this post to offset the cost of my site and providing free information and tips to you.